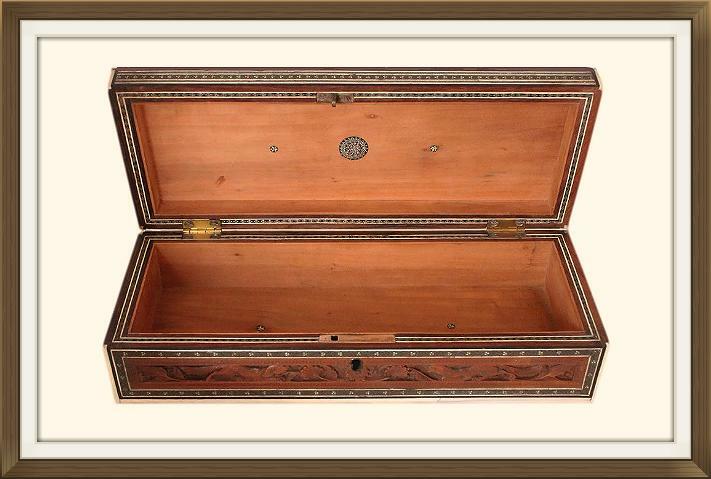 This is a beautiful antique Anglo Indian jewellery or trinket box. It dates to the mid 19th century and is complete with its original working lock and key. The exterior is made of solid Sandalwood. 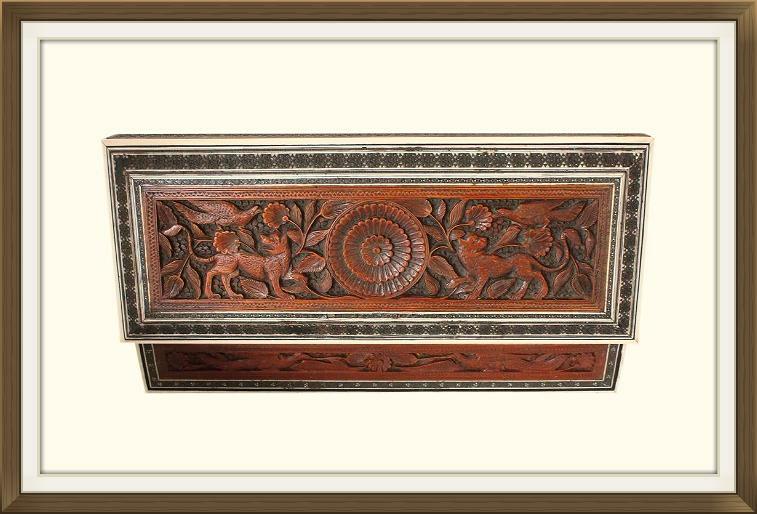 It has superb, intricate, crisp hand carved panels, to the lid and all four sides, plus beautiful strips of mosaic inlay framing all of the panels. There are also further frames within and around the mosaic frames, which are made of strips of bone. The strips of mosaic inlay to the front, back, and sides, feature tiny mosaic roundels of Mother of Pearl, in three different shades. A description of the mosaic inlay on this box can be found further down this page. The panel to the lid features deeply carved, wolves, birds and leafy vines. It also features a superbly carved and multi layered, floral centre piece. The panel has been set so that it displays upright when the lid is raised. This is intentional even though it appears to be upside down when the lid is closed. The panel to the front of the box features dogs and leafy vines, and those to the back and sides feature birds and leaves. Again, all beautifully and deeply carved. The hinges to the box are original. These are quality, solid brass 'stop' hinges, and they prevent the lid from extending too far back. The hinges have been newly polished and new screws have been placed in the top sections of the hinges. 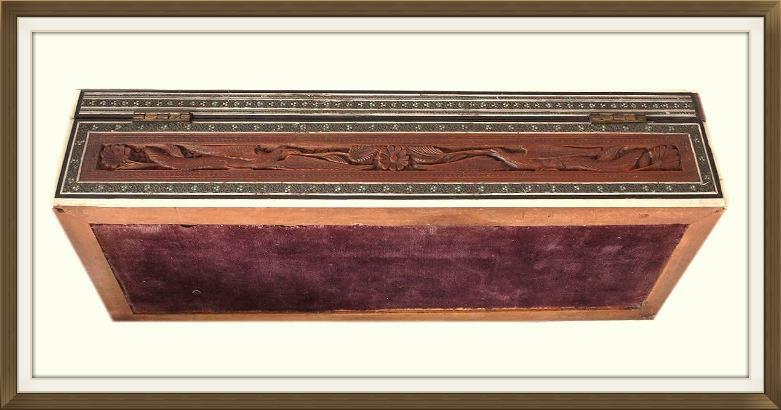 The bottom of the box has a beautiful velvet panel which is a lovely shade of violet. This is completely original. There would've originally been small brass feet on the bottom. These have been removed at some point in time, but the box sits quite stably without them. 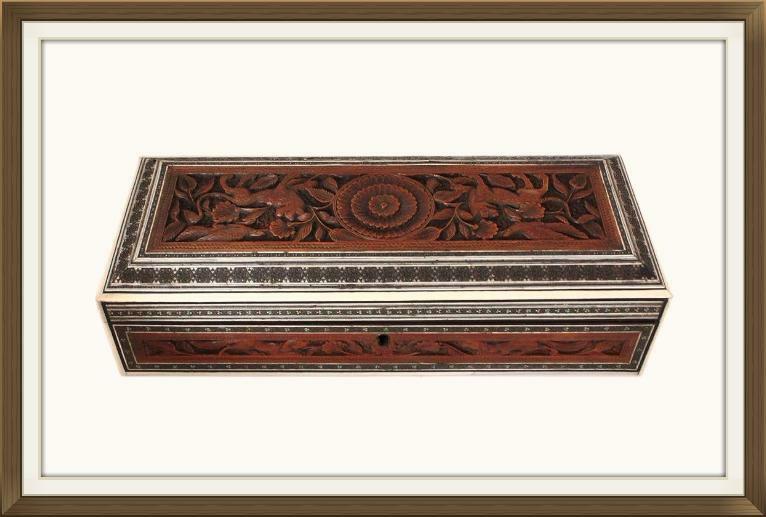 The type of mosaic inlay on this box is known as 'Sadeli' inlay. This type of inlay is very time consuming, with every single piece being painstakingly set by hand. The time taken to create this form of inlay, results in workmanship that is of a very high quality! The interior has a single long compartment. This features beautiful roundels made from inlays of Mother of Pearl and white metal. It also features beautiful narrow frames to compliment those on the exterior. These are made from strips of inlay consisting of Mother of Pearl and bone. The box is in superb condition, despite its 160 or so years of age. All of the inlay is intact, with only minor slight lifting/minor small cracks, in just a few isolated areas. One tiny piece of bone inlay (to the rear left corner of the lid) has been professionally replaced with a piece of Sandalwood. All of the carved panels are in excellent condition with no damage whatsoever! The box locks extremely securely with its key. The lock is a little stiff and clicks loudly when turned, but this doesn't affect its good function. The hinges are in superb condition and in perfect working order. 25.5 by 8.5cm with a 3.5cm depth. International postage is by Royal Mail International Tracked & Signed. This service delivers fast, within 3-5 working days to Europe, and within 5-7 working days to the rest of the world.